Yes, I will purchase these each year. 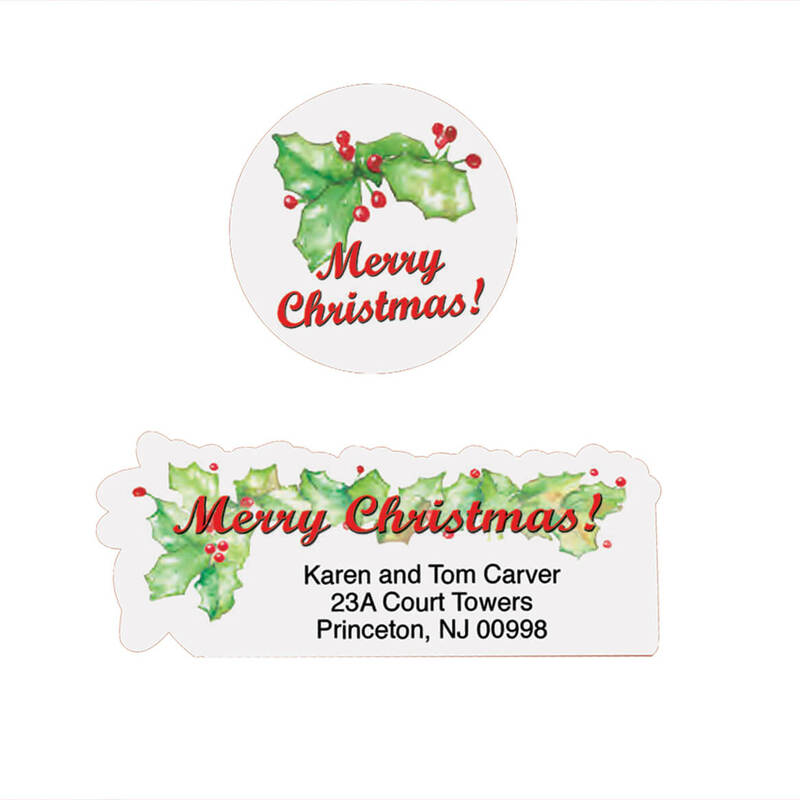 I love to use these labels and seals on my Christmas cards. Very good quality! Second time I have purchased these labels! This is my 4th order of these labels. I love the message and they add to my Christmas cards. I wanted address labels that said "Merry Christmas". When I saw these I knew they were exactly what I wanted. When I received them I was even more pleased. If you want labels that are pretty, colorful, and say what needs to be said at Christmas - I highly recommend these. You won't be disappointed. I really like these labels . This is my second order of them. This arrived quickly and was exactly as expected. I am very pleased with the quality! I love that the labels will stand out. The stickers really made my envelope look pretty. Each sticker stuck well to the envelopes. I do not have a negative statement. Absolutely pleased with my personalized labels after having called three times to change wording. Seals were a great match and fit current Forever stamps for this holiday. Both were the icing on the your profound Christmas cards which I also ordered. Will be looking forward to next years items. Labels and seals are very bright and colorful. Makes the envelopes look very professional. Wanted the cards to be Christmas and these made the envelope look so nice back & front. Would definitely order again when I run out. I really liked the way it looked and that's way I got them . After getting them and seeing for myself I'm glad I got the set . I bought the Merry Christmas Labels and Matching Seals as I will use them on my Christmas cards. I have a couple of other Christmas matching labels and matching seals from Miles Kimball. They are very pretty and festive. I am replenishing my supply because I am getting low on the supply I previously had purchased several years ago. These seals and labels are so pretty and easy to use. "I would buy these labels anytime!" I loved how the labels and seals said, "Merry Christmas"!! Plus the decoration used was just enough for the size etc. I'm so pleased with the whole outcome and "look" when my cards were finished, signed and sealed... Thanks so much!! We buy these labels and stickers every year for our Xmas cards. They are perfect and delivery was fast. Beautiful and many options to choose from make these a great choice. I used to love Miles Kimball and hadn't ordered from them in years but I am so pleased with the recent purchases. These labels are going to make a wonderful addition to our Christmas cards. They are very nice and reasonably priced. I also got the matching seals and am just as pleased with them. The printing is very well done. My husband and I are thrilled with both items. Would definitely order again in the future. These Xmas labels were just what I ordered. Perfect price. Love the self-sticking labels. Just put them on the envelopes & you're ready to go. Thank You. This is a replacement item, having bought them prior and had to replenish my stock. They are easy to use and dress up my holiday card. I just placed my order for this year. I get these every year for my Christmas cards and they really make a difference instead of sending just a plain envelope to my family and friends. I highly recommend these labels and seals - oh, and they really do "stick" - as opposed to those cheap labels and seals that won't stay on the envelopes and packages. I have been using for years. Ive used these labels and seals for several years and ran out this year so I ordered a double amount this time! I love seals that match my return address labels! Glad it says "Merry Christmas!" 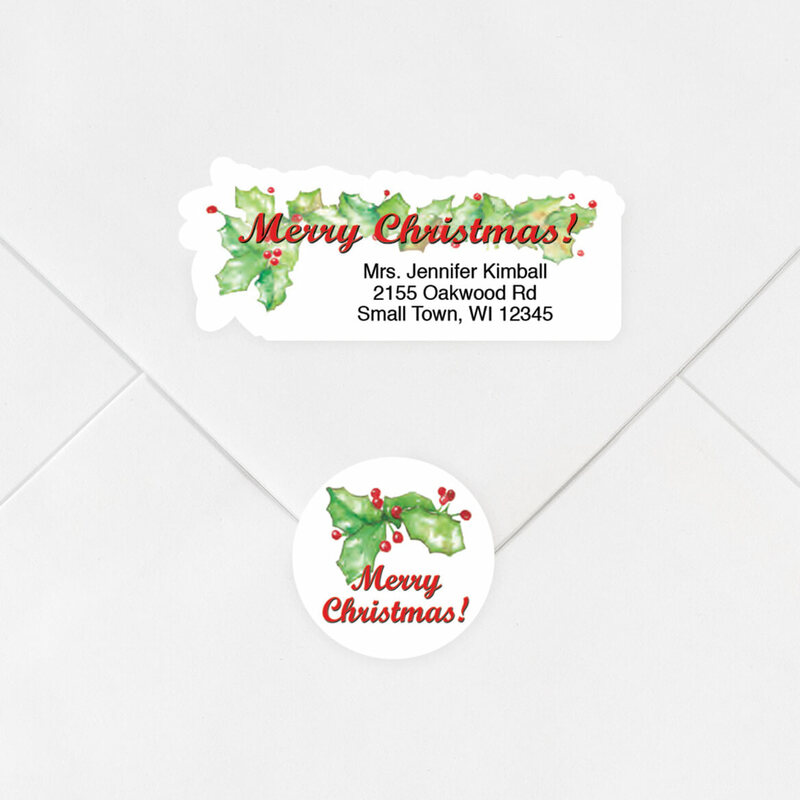 I was so delighted to find address labels that actually said "Merry Christmas! "on them. I ordered them last year and felt like I was honoring the true reason for Christmas every time I put one on my Christmas cards this year. Now I can get the seals that match! And at a great price! I have looked everywhere on-line and Miles Kimball is the only place I could find them. I am so grateful to Miles Kimball for offering them. It was difficult to find some pretty holly address labels. These are just what I was looking for. Very, very Pleased with my Christmas Labels and Seals ! I will use these at Christmas for the Christmas Cards I Send. Love these labels & seals, had them before. Was running low, so decided to purchase more for next season! Used the seals for our Christmas cards as well as decoration on presents wrapped in tissue paper. Can't wait for next Christmas! Your Christmas cards always fit my style. They are beautiful and a good value. Many of my friends comment on the cards I send. I come back year after year. Excellent for Christmas cards. Very nice design. Makes sending Christmas cards so much faster !! and matching !! The labels and seals say "Merry Christmas" even before the envelope is opened! Adds so much to the celebration of Christmas! They jazz up Xmas mail. The personalized labels and the seals were a great great way to complete sending off our annual Christmas cards. They looked very expensive, however, the cost was a great price for both. Great landing! Makes sending Christmas cards easy. Saves on my writing hand. The prettiest ones I have seen. I like that they are die cut and say "Merry Christmas" vs. "Happy Holidays." Use these on all Christmas cards- love them! Glad it says "Merry Christmas"
I love that these say "Merry Christmas". I want to send Christmas cards with "Merry Christmas" stickers and this is perfect, except I wish the green was brighter and the red brighter too. They could perk up a white envelope instead of dulling down a too bright red envelope if they were brighter colors. I love the price of these labels. I can't wait to send out my xmas cards and use them. I choose these Christmas labels because they show my support for saying "Merry Christmas." I wanted to convey to people that it's OK & even good to say "Merry Christmas"
I still send out a lot of Christmas cards, and I like the added touch of a festive address label and envelope seal. I have order these labels before and I was very satisfied. I chose these because they say "Merry Christmas" on them. I been buying different Labels and seals from here for a few years. Makes getting your cards out faster. And they are nice and have Merry Christmas!! Whoa! Did not buy this particular label. I liked that it said Merry Christmas and the design is very pretty. Not many people still say Merry Christmas anymore. It's usually Happy Holidays. I'm old fashioned and I like to wish people a Merry Christmas. Besides I love the colors and design. I love that they say Merry Christmas.. I have been ordering for you for 18 or more years. Like them and quality of Miles Kimball in past. Liked them and it has both our names on them. Liked the idea of labels and seals matching. Because they said Merry Christmas and not Happy Holidays on them. I sent out nearly 300 Christmas cards a year & I like how they are cut out & not just rectangle. Love these return address labels and seals. I have bought them before and was running out. Time to reorder them. I purchased them before last year! Because I liked the Merry Christmas and the pattern. Needed something that said "Merry Christmas" not Season's Greetings. I have had these before and really enjoy using them. I have used these for years; always reorder when I run out. Not only practical and easy,but very pretty. do these come with Merry Christmas printed on the holly like the picture shows? BEST ANSWER: The labels are exactly as they appear with Merry Christmas printed on the lower half of the holly. These labels and seals are absolutely beautiful and my favorite to use every Christmas. Thank you for your question. Merry Christmas is on the top of the labels as shown. We hope this information will be of help to you. Yes they have the print on them! ???? Yes they do. This is my favorite set! Yes. They are very pretty. Thank you for your question. Comes as a set of 150 labels. We hope this information will be of help to you. It said that there were 150 and I assume that there were. I did not count them as I used them. 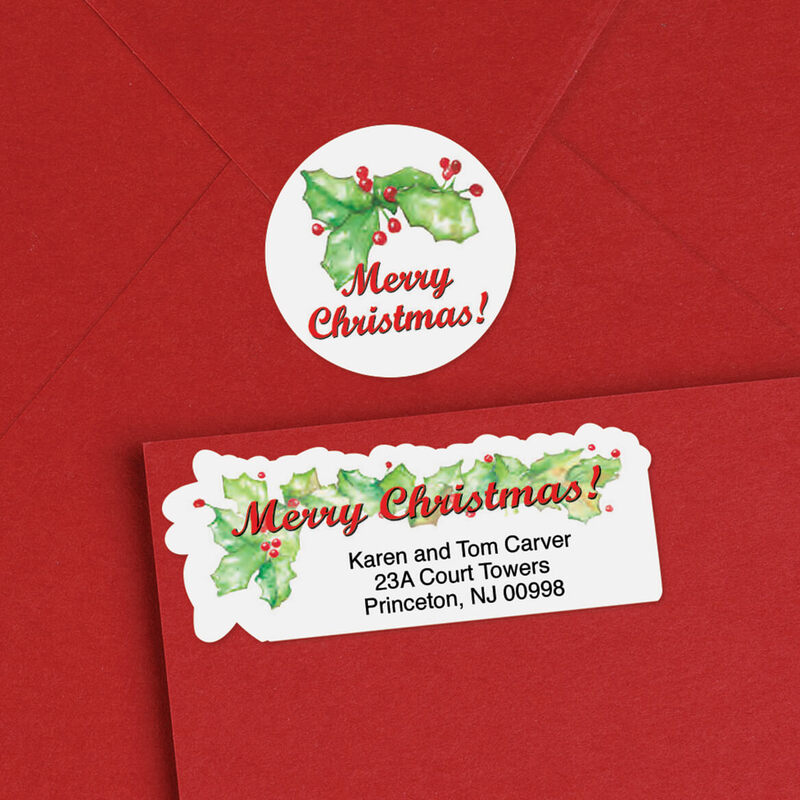 Do you have labels (sheets) for me to type addresses on to send on Christmas cards to friends? Not return labels. BEST ANSWER: Thank you for your question. We do not have ones for sending labels. We apologize for any inconvenience.